"The Day of the Dead-tour with Louise was the highlight of our stay in Guatemala. constructing a giant kite, seeing the villagers walking up towards the festival. 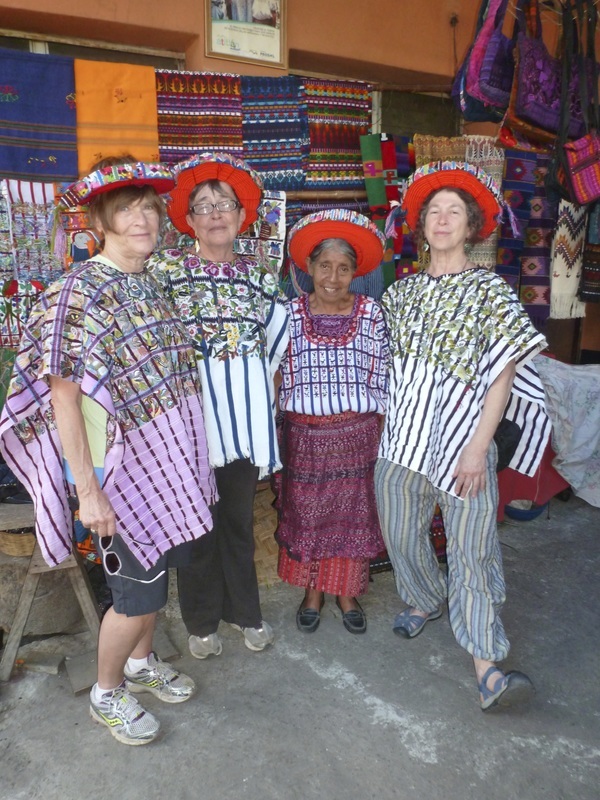 It was a splendid tour that we strongly recommend to you to experience too." "The Giant Kites of Sumpango/Festival of Los Barriletes Gigantes tour with Bright Future Global Tours was truly one of the most creative events I have ever experienced...and besides that, it was FUN! I've lived in Guatemala for several years, but had never been to the kite festival, so when I decided this would be my year to go, I searched for the best way to get there. I'm so glad I found Louise Wisechild's tour because it is unlike any other. Louise coordinates the itinerary with local Guatemaltecos and tour members get a unique behind-the-scenes connection to all aspects of the festival, including the honor of being invited to an intimate Kachiquel Maya shaman ceremony, a visit with kite-builders putting the finishing touches on their creation the night before the festival, a kite-making workshop, and the festival itself. An added bonus is that all this takes place while staying in the private home of a warm and friendly Sumpango family, just a few minutes walk from the cemetery and field where all the action takes place. To top it off, Louise's friendship with master kite-builder, Julio Asturias, and his generous contribution to the group, is like the tail of the kite that helps it fly high! No need to look any further if you want to celebrate the Day of the Dead at the Sumpango giant kite festival. This tour is the best way to gain the richest experience!" 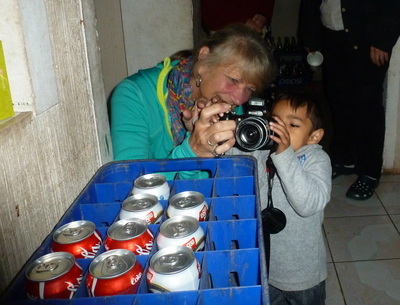 "This trip is a fabulous experience of being in Guatemala for those interested in more than peering through tour bus windows. 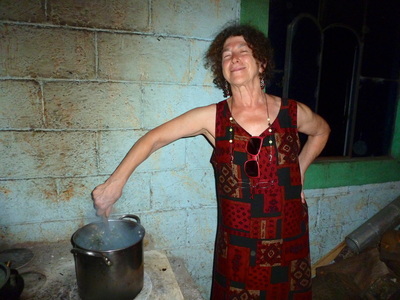 The guide, Louise Wisechild, lives in Guatemala and has a passion for sharing the history. The Day of the Dead Tour includes a Mayan Ceremony in the cemetery in the evening on October 31. As a small group we were included in the ceremony. Having a young local woman take my arm to invite me into the ceremonial circle was just a part of the warmth of the evening. The cemetery was not a frightening place but a place to respect the dead, ask for healing and honor the future. The shamans exuded love for the ceremony reflected in the light of the candles and fire used to light the darkness as they chanted and blessed the young women chosen to be future leaders. Giant Kites of Sumpango included a home stay to really experience the excitement, preparation and magnitude of the day. We visited a market in preparation for the day, watched the final assembly of a giant kite six months in the making. The excitement was partly seeing the kite come together and partly the looming deadline the next day. The grand finale the flying of the kites was a day long gathering of flying kites in competition groups. The excitement of the crowd and announcers as each kite flying team, yes teams of 5 to 8 people and ropes managed these kites, worked to get the kites flying in the three allowed attempts. Sumpango is crowded with guests, so homes turn into kitchens and serving areas as well as hotels to accommodate everyone. Yes we did have to share a bathroom with the whole family, but we also were privileged to share the daily events and warmth of the family and the excitement Giant Kites celebration. It is an event of awesome effort, amazing art and crowd pleasing fun. the opportunity to see the process of kite-making through to the Day of the Dead celebration. I really appreciated the generous hospitality of our hosts."